The increasing demand for skills in the field of mechatronics, coupled with the alarming shortage of robotic and mechatronic skills in South Africa, poses a serious problem to growth and development within the local automotive industry. South African universities have the potential to stimulate technology and innovation and therefore play a leading role in the development and transfer of relevant skills within the industry. 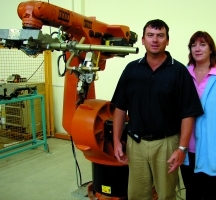 The Nelson Mandela Metropolitan University (NMMU), situated in Port Elizabeth, recognised that there is this urgent need for skills and is focusing on addressing the industry's demands by equipping its Engineering Faculty with the latest technology in order to train and produce engineers with the necessary industry skills. NMMU is the first university in the Eastern Cape to offer the Bachelor of Engineering Mechatronics Degree, which was launched this year with a group of 34 students. Through careful analysis of market trends, and together with the experience and guidance of industry partners such as LN Manufacturing, Comau and the DTI Innovation Fund, NMMU has decided to implement Catia engineering software solutions for its new intake of students in 2006. Next year NMMU hopes to introduce 40 students into this programme and will then become the first university in the country to offer courses using Catia as the CAD/CAM software solution. Karl du Preez, HOD of Mechanical Engineering at NMMU, says that they are aware of and carefully considered various other software options, and selected Catia's integrated approach as their preferred solution. "We want to move away from using a different software package for every area of the design and manufacturing process," he adds. Du Preez explained why they selected Catia solutions: "We made our decision based on demand and what the industry wants. It is the latest technology and what is needed in the Eastern Cape." NMMU's vision as a Higher Educational Institution is to raise the standards of the local industry by offering training to meet the demand and provide industry with adequately trained graduates who match their needs. Because Catia is the system of choice in the automotive industry, Catia-trained graduates enjoy a significant advantage when they commence their working careers. NMMU recently acquired a robotics laboratory that was made possible by a consortium agreement with local industry, the NMMU and government. Together with their new Generic Robotic Training Centre, Catia V5 will be used to design and manufacture 3D parts; then Delmia, which is also part of Catia's integrated product portfolio, will be used for factory layout and robotic simulation. Catia is the only CAD/CAM product that is fully integratable with a robotic simulation program such as Delmia. Du Preez says they also plan to use Delmia for handling offline programming, which is in great demand in the industry. The ability to program offline and simulate a robot path prior to production saves a considerable amount of time and eliminates the potential for collisions between robots, parts, tools and fixtures. Delmia is used extensively, both worldwide and by local OEMs and suppliers such as Toyota, DaimlerChrysler, Comau and Design International for manufacturing simulation. CDC (CNC Design Consultants) is supporting this enterprise by sponsoring a Catia Certification Programme. This will ensure that NMMU's trainers will have the knowledge, tools, methodologies, and technical skills necessary to train its students. To cater for the growing demand, NMMU plans from next year to offer short Catia V5 courses to the local automotive industry. Businesses and engineers will have the opportunity to undergo an interactive learning experience within the mechanical design environment and develop the skills that will enable them to apply this knowledge in their work situations. CDC sees NMMU as a strategic industry partner in the region for training Catia engineers, particularly in the field of Body-In-White. Through using Catia and its integrated suite of solutions, NMMU intends to educate and train quality engineers to master the technology demanded by leading OEMs and suppliers in the automotive industry.